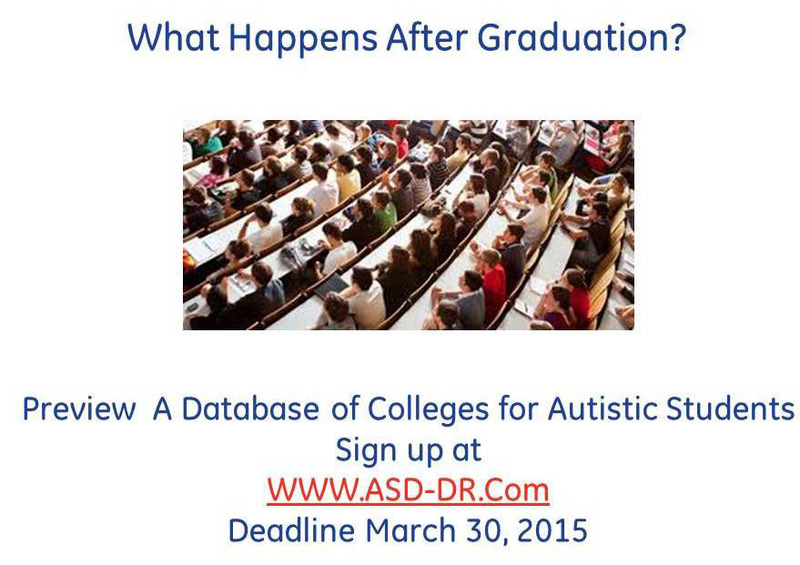 ASD-DR.com is launching a college-search resource to help families with autistic students. There are many online search sites with information about colleges, but few of them include information on the support services available at these institutions. This new resource allows parents and other caregivers of students with autism to search through a database of over 300 colleges across the U.S. with autism services. What search options should be added? What information is not needed? Be sure to sign up by March 30. The database will be available only for those who have a log-in and password, which Dawn Marcotte will provide on April 1, 2015. Those interested should sign up at www.asd-dr.com. Written by: Different Roads to Learning on March 20, 2015.on March 19, 2015. This entry was posted in Academics, autism, Autism Awareness, autistic spectrum disorder, Resources and tagged autism, autism education, college search for students with autism, colleges with autism services, developmental delays, developmental disabilities, family struggles, Resources, special education, transitions by Different Roads to Learning. Bookmark the permalink.